on Wednesday, October 23 @ 7 pm. For everyone who fell in love with the cast of characters in Urban Tigers you’re in for a real treat! Urban Tigers Two: more tales of a cat vet (M) is here and tells the continuing story of Dr. Emily McBride and the many adventures at the fictional Ocean View Cat Hospital. All of your favorites are back, including the beloved Dr. Hughie Doucette, the caring and loving staff at the clinic, and Emily’s mother who is still trying to find her a husband. 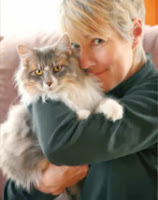 Kathy Chisholm is a great storyteller who combines humor, compassion, and caring in her tales. She doesn’t hesitate to show you the sad side of work in a vet clinic and the tough decisions that caring animal caregivers must make on a daily basis. But Chisholm’s writing also give us hope that there are still caring people out there who don’t see cats as disposable creatures and who are willing to go to great lengths to see them treated humanely and responsibly. If you love cats (or any animal) and great stories then pick up Urban Tigers Two. You’ll laugh, you’ll cry, but mostly you’ll marvel at the great lengths pet owners will go to when their four-legged friends are in need of care. By the way, you might recognize the book cover cat as the well-known mayoralty candidate Tuxedo Stan. He ran on a platform of responsible pet ownership and affordable spaying and neutering facilities. While Stan recently lost his battle with cancer, his brother Earl Grey is continuing his political work and ran a spirited race for Premier of Nova Scotia.